The 39-year-old described his 'Pappy' as "an inspiration". Source: Facebook/Cameron Douglas. He was the original Hollywood gladiator back in the ’60s when he graced the silver screens as roman slave Spartacus, and now Kirk Douglas has proved he is still fighting fit as he went camping at the age of 102. 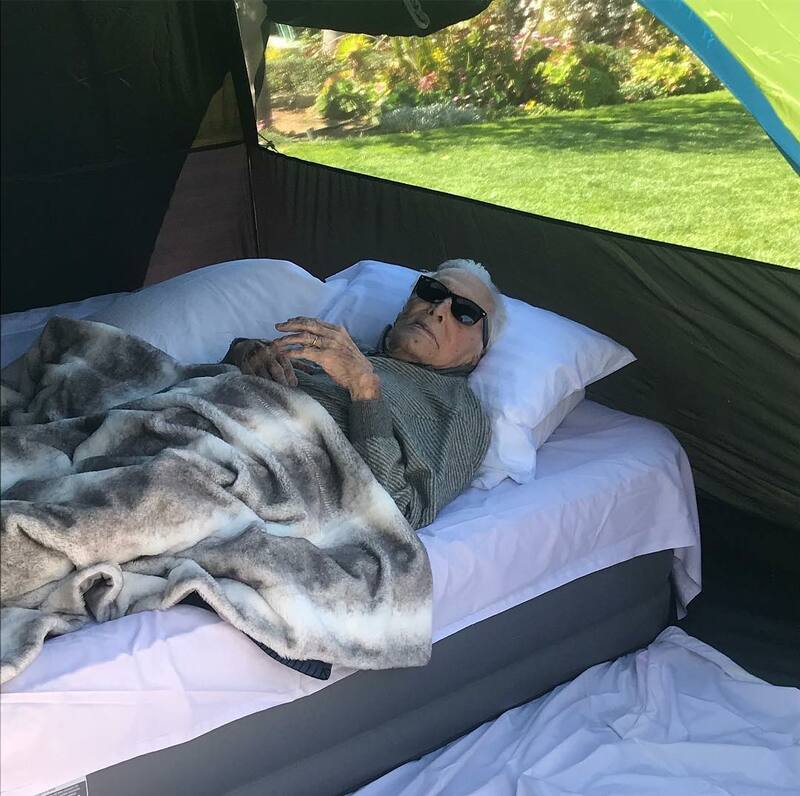 The acting legend can be seen lying on an inflatable mattress inside of a tent in a series of sweet candid photographs, which were shared on social media by his grandson Cameron Douglas. Smiling for the camera, the Paths of Glory star can be seen lying beneath a fur blanket, dressed in a knitted jumper and wearing a pair of oversized dark sunglasses. “This amazing man, my Pappy, is such inspiration in so many ways! Going camping at 102!” Cameron wrote alongside the images. Fans were quick to praise the Golden Age icon, with one writing: “That is amazing, enjoy your time with him.” Another said the photos were “bloody brilliant”. The Spartacus star celebrated his 102nd birthday in December. Source: Facebook/Cameron Douglas. The Lonely Are The Brave star celebrated his milestone 102nd birthday in December as members of his family took to social media to publicly wish him well on the special occasion. Daughter-in-law Catherine Zeta Jones, who has been married to Kirk’s son Michael Douglas since 2000, described him as “the most beautiful man” as she shared a moving black and white video on Instagram. The clip featured the couple’s daughter Carys playing the piano and singing Christina Aguilera’s hit song ‘Beautiful’ alongside a number of photos of Kirk, both from his personal life and throughout his incredible career, including a sweet bit of footage showing Kirk dancing with his grandson Dylan. While Cameron – who is Michael’s son from his first marriage to Diandra Douglas – also shared a sweet message to mark his grandfather’s monumental birthday. Are you a fan of Kirk Douglas? Have any of your relatives lived past the age of 100?